“There’s an illegal demonstration going on in San Francisco and I just don’t think it’s appropriate to do that,” Joseph Califano, the Secretary of the then-Health, Education, and Welfare Department (HEW) under Jimmy Carter, said to a reporter as he loped through a nondescript government hallway. It was April 5, 1977, and protests by the disability rights movement were going on across the country demanding that the federal government sign regulations to activate Section 504 of the Rehabilitation Act of 1973. Once signed, this historic legislation would extend civil rights protections to the disabled and remove obstacles to services from universities, hospitals and other entities receiving federal funds. In San Francisco, the group had decided to stay the night in the old federal building. Califano, a longtime Washington insider, was disgruntled. When the reporter pointed a microphone at the secretary and asked if it was true that he had agreed to a meeting with the organizers and then canceled it, Califano promptly skirted the question and sidled into a waiting elevator. Captured in all of its grainy, hand-held authenticity, this exchange is a scene from “Lives Worth Living,” a documentary on the disabilities rights movement that aired last fall on public television’s series Independent Lens. Califano was the latest in a series of administration officials and members of Congress who had determinedly ducked putting teeth into legislation that had languished since the early 1970s. Back then, Senator Hubert Humphrey had tried to amend the Civil Rights Act of 1964 to include people with disabilities, as David Pfeiffer recounts in a fascinating overview of the struggle. Several years of Congressional machinations, legislation without regulatory authority and HEW dithering followed. Finally, the board of the American Coalition of Citizens with Disabilities had had enough. It voted to launch nonviolent demonstrations in HEW regional offices across the U.S. if the regulations were not signed by April 4. The next day, with no regulations in place, the demonstrations and sit-ins began. The San Francisco occupation became the longest sit-in ever in a federal office. While most of the other demonstrations ended at closing time on the first day, the occupations in Washington, D.C. and in San Francisco, led by Judith Heumann, dug in for what turned out to be the long haul. One day led to the next, and then the next and then the next. An interview with a HEW representative conducted years later (also featured on “Lives Worth Living”) offers a sense of what official Washington was thinking: “They had taken over the federal building in San Francisco — and we were under the gun to do things quickly, to make this stop, to make it go away.” This brief peek behind the curtain of officialdom is a heartening and instructive glimpse into what policymakers often are actually calculating in such trying circumstances, even when a movement believes that nothing is happening and it is not making headway. At the same time, the film conveys the gumption that was growing among the occupiers, as in a riveting scene from the San Francisco protest in which a young woman in a wheelchair explains, “It’s the first really militant thing that disabled people have ever done, and we want people to listen to us. We have tried negotiations, and at this point, we are not negotiable, we want those regulations signed.” And so one hundred people stayed put for twenty-three days until Califano relented — and signed. Not only was this legislation a forerunner of the landmark Americans with Disabilities Act passed in 1990, it helped to catalyze the diligent organizing that would help make the ADA a reality. Two clips from “Lives Worth Living” derive from the dramatic action that helped clinch its passage: scores of people with disabilities crawling up the steps of the U.S. Capitol, and then their subsequent arrest in the Capitol rotunda. 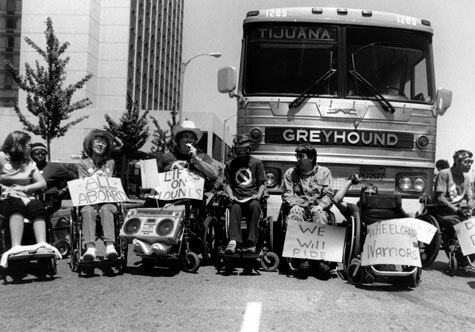 Other dramatic waves of nonviolent action followed the 1977 sit-ins, including ADAPT’s campaign focused on access to public transportation, with highly visible civil disobedience actions in which people in wheelchairs chained themselves to city buses. Since its initial campaign, ADAPT has led many direct action efforts, a few of which can be found on the Global Nonviolent Action Database: preventing budget cuts to Medicaid Home-Health Services, 2002; winning support from Governors for Medicaid reform, 2002-2005; and campaigning for affordable and accessible housing in Chicago, 2007. Today, the struggle for full equality for people with disabilities continues; ADAPT, for example, is staging a national action in Washington on April 21-26. The thirty-fifth anniversary of the launch of the federal office sit-ins offers us an opportunity to pay honor to the women and men who, through their stubbornly bold actions, utterly transformed the architectural and psychological landscape of our society (and, increasingly, other societies as well). Accessibility became three-dimensional, as buildings and transportation everywhere were remolded so that the visible and invisible barriers to inclusion began to be razed. It also began the slow process of uprooting ancient scripts of exclusion and re-writing history. As the lineage and growing experience of nonviolent resistance suggests, this very metamorphosis of building codes on the one hand and social codes on the other flows directly from the grit and determination of taking action — including staying put in the very buildings you long to change. I am grateful to “This Week in History” for listing the April 5, 1977 sit-in at the San Francisco federal building on its online peace calendar.